What an elegant and luxurious look! Gorgeous high quality pieces. The weight of this design feels expensive but they are so affordable! 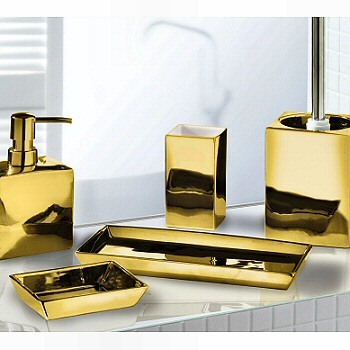 The Glamour bath accessory design is made of thick high quality porcelain and the gold and silver finishes are exquisite. Tumbler: Square design with the white porcelain revealed on the inside. This piece can also be used as a toothbrush holder. Soap Dispenser: This rectangular dispenser is sizeable so you are not refilling it all the time plus it is not too big for your vanity top. The pump heads are very well designed. Soap Dish: This rectangular dish shown in the lower left corner of the product picture has a flared design to the sided which is an elegant feature. Toilet Brush Set: The toilet brush set is a square design. Both the gold and silver color options have a shiny chrome handle attaches to a smartly designed toilet brush head. The top of the brush is black because it is visible from above. This gives this toilet brush set a much cleaner look after each use. Gold: Like a gold bar! The mirror finish is beautiful. The dispenser has a matching gold pump head. The gold toilet brush set has a chrome handle. Silver: Beautiful silver grey. Truly the color of a mirror. Just an amazing finish.